Ever time I fire the kiln (almost always overnight, while I'm sleeping) I wake up feeling the most intense anticipation. Did it finish? Did it go "pop" like those internal temperature devices in turkeys? For quite a while this past year, it didn't go pop because one of my elements and connectors needed to be replaced, so I would run back out to the kiln, through the wet grass in my bare feet, wondering if the kiln was still hot enough (it always was) for me to turn it back up to high for another few hours. This morning I woke up at 6 (the dogs are my best alarm clock), ran blindly (oh, I am SO blind and never can find my glasses first thing in the morning) to let them out, did my dash through the wet grass, happy to see that the kiln did indeed "pop." Back inside, feed the dogs, make coffee, find glasses, sneak a peek (top layer looks good! ), now wait until the evening or even Monday morning until the kiln is cool enough to unload. This is the kiln sitter- a wonderful (to me!) 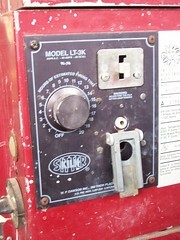 device that measures both the temperature and the time for firing. The knob to the left is the timer- after x number of hours it will shut itself off. The white circle and the silverish rectangle to the right measures the temperature. A tiny little stick called a mini-cone goes inside three prongs on the inside of the kiln. When it gets to the right temperature( about 2200 F/ 1240 C for glazes, cone 6), the cone begins to melt, causing the top prong to come down and that rectangle drops, shutting off the power to the kiln. I like this way of firing- many potters use programmable kilns, but I like to turn it up and control the speed of the firing myself. Luddite that I am, I'm always suspicious of digital readouts on equipment. Just one more thing to break down. I don't use witness cones (big versions of the mini-cone) because I'm lazy and I never can see them through the peep hole anyway. Most potters do. I've been chastised on more than one occasion for not using them. More information that your ever wanted about kilns? Probably.